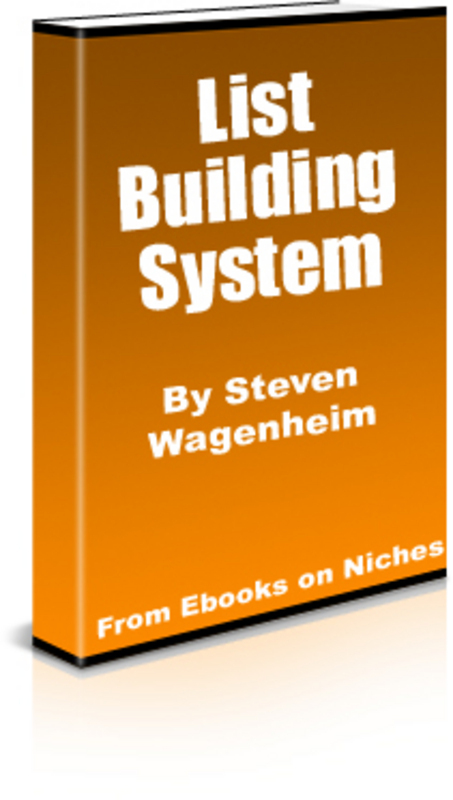 Steven Wagenheim´s List Building System+2 Mystery BONUSES! My 4 Steps Newsletter (some of you may be on it) is my #1 list builder and has earned me thousands of dollars in income! Yes, the same 60 Solid Tips as in my Mind Warriors post except complete with DOC file to modify anyway you like and a resource section to include your own links or affiliate links to my products. I suggest using the affiliate links to my products because they strategically tie into the report itself. 3. Learn how to write...well! 4. Learn basic design skills. This is a very short but powerful 12 page report outlining in explicit detail, 3 actual plans that I use to earn part of my online income. This alone will prove invaluable to you for earning an income yourself even if you didn't give it out to your list. These are 3 things I do every single day of the week. They work for me and they should work for you as well. This is a 10 page report that goes over 5 key items that have greatly contributed to my success online. Again, it's a great report for a freebie and will also help get you in the right frame of mind to run your own business. This is a 10 Page Report that covers 3 forms of promotion that I use with great success that don't cost me a DIME. One of them generates 67 of my monthly income. Another great giveaway. But that's just the start. This package also includes my 52 week 4 Steps Newsletter series...all 52 weeks of it. If you can't sell to your list with that much content, you are in the wrong freaking business. I'm serious. Like I said, this series has earned me THOUSANDS. Those of you who are on it know how good it is.